Doughnut lovers, rejoice: A new shop offering freshly baked treats and coffee has opened in The Loop. The family-owned Firecakes Donuts, which has three other locations in Chicago and a food truck, can now be found at 205 W. Lower Wacker Drive in the Wells Street Market. Using an old family recipe and locally sourced ingredients, per its website, Firecakes makes doughnuts in classic flavors like wildflower honey glazed, triple rich chocolate cake and pistachio old fashioned and seasonal varieties such as banana split and strawberry mascarpone. Looking for a cool treat? Order a doughnut stuffed with housemade ice cream and add a topping from a list that includes hot fudge, toasted coconut and candied peanuts. Hot and cold caffeinated beverages and juice are also available. See the full menu here. 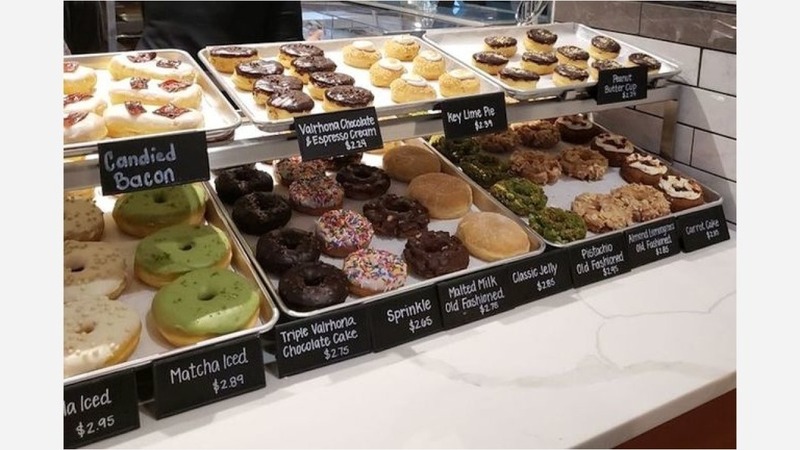 The market opens at 11 a.m. but a walk-up window is available starting at 7 a.m.
Karen K., who reviewed the new spot on June 22, wrote, "Yesterday I had the pistachio old fashioned donut from this new Firecakes location. Even during lunchtime it was still so fresh. ... I'd be so bold as to liken this place to the famous Donut Vault, but with all their seasonal options, they might even be better!" Head on over to check it out: Firecakes Donuts is open from 7 a.m.-8 p.m. daily.